In 2006, Paul Gerald contacted me, asking if I would like to run some reviews he had written about places to eat breakfast in Portland. I was dubious, as I frequently get approached by folks with great ideas that they never follow up on, people with personal agendas, and quite a few who have a sense of taste that varies greatly from mine. However, I took a look, enjoyed the writing, and immediately started posting everything he sent to me. 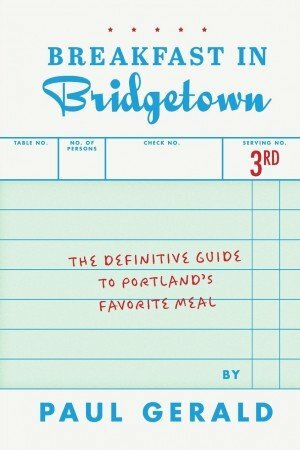 In 2008, Paul published the first edition of Breakfast in Bridgetown, “The Definitive Guide to Portland’s Favorite Meal”. Since then, he has been the go to guy when it comes to breakfast. 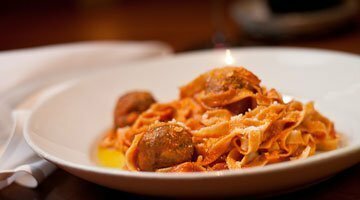 In his just released 3rd edition, all the lists are updated, new restaurants replace those which have closed, and a variety of lists have been added. 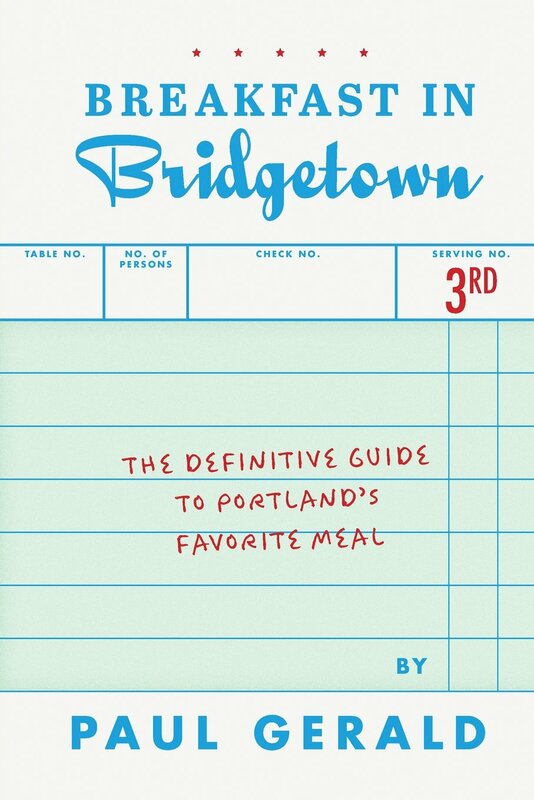 The 3rd edition contains 120 detailed Portland restaurant descriptions, plus helpful lists such as “The Downtown Hotels”, eighteen “Breakfast Carts”, and seventeen “Out on the Road” choices. In addition, he covers “Early-Bird Places”, “It’s Breakfast for Dinner!”, “Kid-Friendly Places”, “Best for Large Groups”, “Veggie-Friendly Places”, and “Let’s Eat Out(side)!” Contributing author Martha Wagner fills offers seven Gluten-Free options, and Clark Hass lists his top ten “Hashcapades” (places to get hash) in Portland. One passage in particular made me laugh, because we had a very common experience at the original Podnah’s. One evening I was sitting at a Formica topped table eating burnt ends, and found myself getting teary when they started playing Doc Watson. I’d had a bit of writers block that week, but by the time I finished my meal, I had the whole review written in my head. I have a feeling the same thing happened to Paul. Here is his experience. “The waitress reappears with a plate, and are you kidding me? People eat that thing??? It looks like an alien has landed on the plate she’s carrying, and then puked runny eggs. It’s like they coated a dog-chewed Frisbee with gravy. They should require you to be stoned before you tackle that damn thing. …And then I conjure the speech from Lord of the Rings, right before they wade into the sea of orcs: “Breakfast Guy, there may come a day when you cower at the site of your meal, when you ask for a to-go box before you even start, when you ask if somebody wants to go… splitsies. But this is not that day! In the dynamic PDX restaurant world, even the latest edition is going to be a bit out of date, so Paul includes a list of changes when you buy the book from him, and also details them on his website, which is frequently updated. Another nice touch is a checklist at the end of each restaurant, with details such as how long is the wait, does it work well for large groups, healthy options, WI-FI, etc? Breakfast in Bridgetown is a great book to have around when you want to try something new. Heck, breakfast is my least favorite meal, and I read it cover to cover. I highly recommend it. Paul sells it over along with a selection of hiking and camping books at his website, at Powell’s Books, and fine booksellers near you. If you catch him in a weak moment, he might even do a bundle for you. Category: Authors / Book Reviews, Food Writing. More about Paul Gerald. Thanks, Dude! I am so glad you enjoyed the book, and really appreciate your posting the review. Sorry it took me a bit to catch up on reading it’ my brain is currently being addled by Tuscan dining adventures. My heart bleeds for you Mr. Gerald. where can I buy the 3rd edition? Hello! Thanks for asking. You can get the third edition, plus all the updates since it came out, on my main website, paulgerald.com.